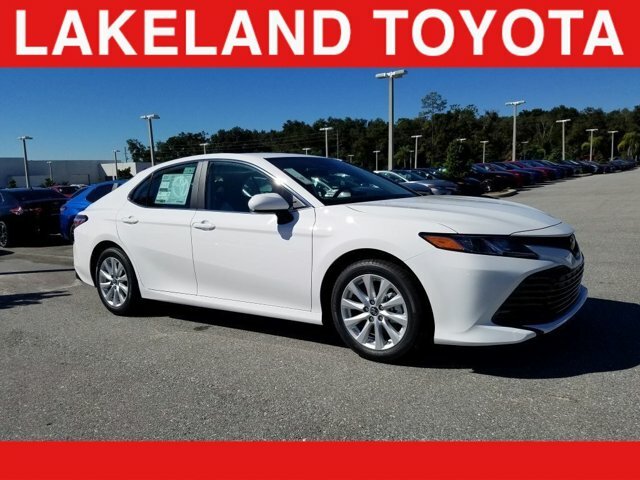 Sporting an athletic, modernly refined exterior, the 2019 Camry matches its modern styling with equally as modern tech, safety, and performance features. The 2019 Camry varies from the previous years' model in one aspect: it adds Apple CarPlay functionality. Beyond this, the Camry remains mostly the same.Read on to learn about the standard and available features that drivers can select on the 2019 Toyota Camry. With seven trim options to choose from, drivers have lots of choices when it comes to the 2019 Camry. Plus, three of the trims are available in hybrid versions. The base trim (L), comes standard with a 2.5-liter engine that provides 203 horsepower and 184 foot-pounds of torque. Paired with 203 horsepower engine is an automatic transmission. Higher trim models come with a range of tech, safety, and comfort features for drivers to enjoy. From dual-zone climate control, to leather seats, a JBL premium audio system, a bird's-eye camera, Qi-compatible wireless phone charging, and a head-up display. The Camry comes with an eight-inch touch screen that sports an Entune 3.0 infotainment system with Wi-Fi, Apple CarPlay, Siri Eyes Free, and Google voice functionality. Other than the standard 2.5-liter engine, drivers look for more power or a hybrid option won't be disappointed. The 2019 Camry offers two additional power options: a 3.5-liter V6 engine that produces 301 horsepower and 267 foot-pounds of torque and a 2.5-liter gasoline-electric hybrid the provides a combined 208 horsepower.